Pancreatic tumors can be classified into four categories: We will focus on adenocarcinoma here since it is the type of cancer found in 95% of diagnosed pancreatic cancer. 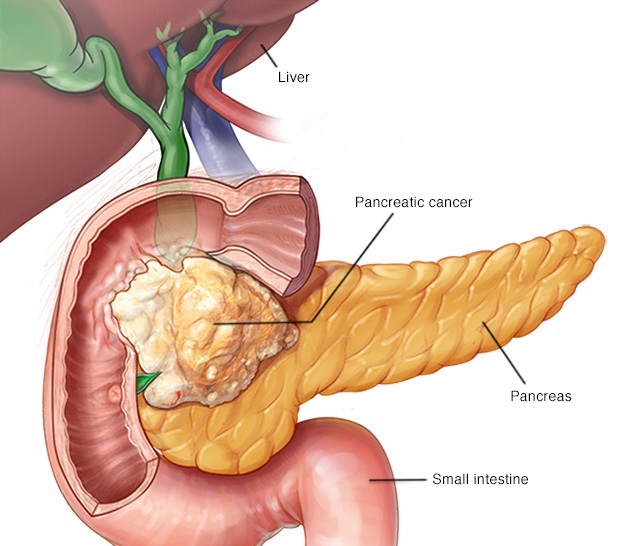 Pancreatic adenocarcinoma is the the scariest cancer that can affect humans. It is no coincidence that they are referred to as the “king of cancer”. The prognosis for pancreatic adenocarcinoma arising from the pancreatic duct epithelium is very poor and most cases are metastatic at the time of diagnosis. Pancreatic adenocarcinoma are most commonly seen in elderly around 70 years old. Risk factors for pancreatic adenocarcinoma include: Smoking is the most important risk factor) and have been shown in many studies. Other associations like chronic pancreatitis, Diabetes mellitus type 1, Fatty Diet, Alcohol intake are all inconsistent risk factors. Genetics have shown some association between patient with BRCA/Peutz-jegher syndrome and link to pancreatic adenocarcinoma. Epigastric pain that radiate to the back and weight loss are seen in 90% of patients. Jaundice and icterus (if tumor block the biliary tree esp head of pancreas) ie blockage of intrapancreatic common bile duct (CBD) which is a sign of advanced disease. Recent onset of diabetes mellitus and glucose intolerance that is mild. If jaundice present – US abdomen (to rule out biliary tract obstruction) – poor visualized pancreatitis or pancreatic necrosis due to overlying bowel gas from ileus. US is also not good for tumors < 3 cm visualization. Very poor prognosis involve a massive procedure called Whipple Procedure. ERCP/PTC with stent placement to alleviate obstruction for palliation.